s/v Pelican - Following A Dream: Bioluminescence...Fact or Fiction? Watching the dolphins at the bow, and yes, Kaitlin is still in her jammies. Her new record is somewhere around 1 1/2 days in her jammies! Bottlenose dolphin turning sideways to take a peek at us, it was amazing how they look right into your eyes! 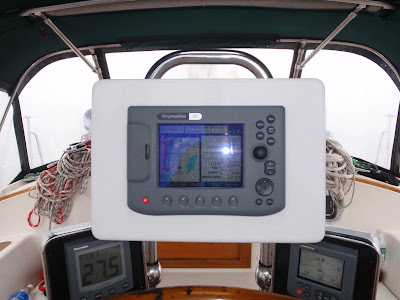 Navigators view in the dense fog. Lets play who can find the bow of the boat! This is the view from our boat when we were in the channel to enter Charleston harbor. Can you see the buoy? Apparently it is only 100 feet away! Kristen here - I'm going to start out with a topic that I never believed in, until I saw it with my own eyes, bioluminescence. Check out http://en.wikipedia.org/wiki/Bioluminescence. On my first ocean night watch from Beaufort NC to Cape Fear I saw it with my own eyes. There they were, like fireworks. It was sparkling green light like I've never seen before....in the toilet! After hearing people talk about leaving a trail of bioluminescence behind their boat as they stirred up marine life, I never imagined my first experience would be in the head! It was just amazing, like static electricity sparks in your toilet. I flushed several times, just to see the show over and over again! You see, our head pulls saltwater directly from outside the boat to flush. Therefore anything in that water goes through the pipes and into your commode, including small marine life. I tried to get the kids to cram in the head with me to see it, but they wouldn't oblige. I could tell that Casey didn't believe me. He had that "Mom is going nuts" look about him. I couldn't blame him, I was never a believer before either. I always thought it was reflection from lights, or the moon or something like that. So, on last nights watch I kept a keen eye out over the edge of the boat. I was determined to prove to my son that I wasn't insane. As the boat moves along, it puts out a wave, and in that wave it looked like glowing green stars. We must have gone through a patch of them, because it was more than I've ever seen before. I called Casey over, and I'll just say that he is a believer now as well. I have heard before that people will jump into the water and be covered in them and the people will actually glow. Somehow I don't think we'll be doing that. We didn't see a large amount, but what we saw was beautiful. As Chris just mentioned, our passage this time was a bit different than the last attempt. I must admit, I was quite a bit gunshy about going out into the ocean again. I listened to and checked the weather as much as possible. It was forecasted to be 2-3 foot waves and wind under 10 knots the whole time. Yet I still asked Chris every 1/2 hour or so, "what was that forecast again, nothing is going to get worse is it?" Nightfall approached and I started shivering. Either I was cold, or I was nervous. Probably a little of both. The day started out a little bumpy, but nothing major. My nerves were a bit calmed when the waves started to thin out toward nighttime. 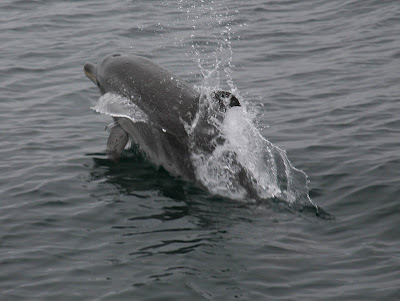 I was also enchanted by our major dolphin sighting. I always consider wildlife sightings as good luck. We spotted them a bit away from the boat at first, but then they came closer. We spent about 1/2 hour watching a herd of about 20 dolphins surrounding the boat. Their favorite place seemed to be right under the bow, darting back and forth gracefully from one side of the bow to another, always matching our speed perfectly and never getting hit as our bow slammed up and down. Their movement seemed to be pure grace and agility. 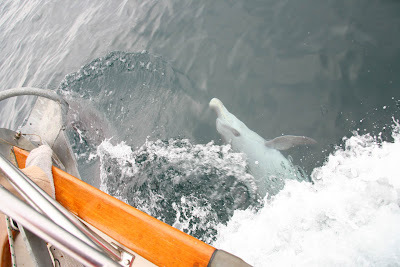 As we were hanging over the bow to watch them, they would turn sideways so that their eye could see us. I swear they were staring right at us as if they knew we were there and watching them. They would watch us for a second or two, again matching the boat speed and staying perfectly even with the bow, and then return to their normal swimming position. They are truly amazing creatures, and I think we will continue to get excited each and every time we see them. 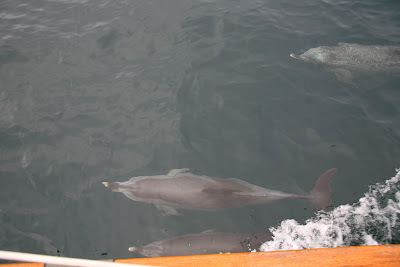 This time we saw both bottlenose dolphins and Atlantic spotted dolphins. Both species played together as if they were part of the same herd. When dinner time came, I went below to make some burritos, which turned out to be amazing for some reason. I think everything tastes better when your on the water. When I came up it was dark. We all ate our dinner in the dark cockpit. Chris then went below to catch some sleep, while Casey, Kaitlin and I did our watch until 8 PM. At eight, Chris took over and we went to sleep. While I am sleeping, I'm still half aware of the motion of the boat. I can feel when the waves pick up, and when they calm down. They went through several ups and downs, but never any drastic motion. I slept well, and waited for Chris to wake me up when he was tired. We decided to try a new tactic when it comes to night watches. Now, instead of 4 hrs on and 4 hrs off, Chris just stays up until he's tired, and then I take over. Last night the switch happened at 2AM. We have found that this works much better. Chris is a night person and has no problem staying up late. I on the other hand need toothpicks for my eyes around 9 or 10PM. I also have no problem going to bed early and getting up early. So far this pattern is working out much better. My night watch was interesting. The fog rolled in and out the whole time. 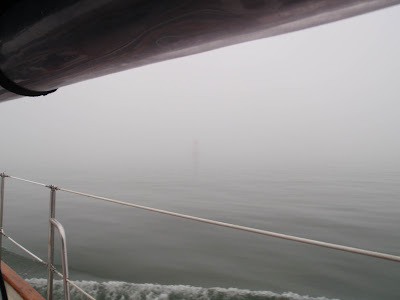 By rolling in and out, I mean visibility went from being able to see the bow of the boat, to barely making out the dorades (foot high metal pipes that scoop air from the cabin top to the living area below) that sit right in front of the dodger (front windshield of the boat). Its quite an odd feeling to be in complete darkness. You are completely reliant on your instruments and your senses. I have a tendency to stare at the chart plotter. It shows where you are going, where you are relative to land, what ships and buoys are around you, and is generally comforting. The fog was cold and damp, so Casey and I put up the full enclosure to keep warm. The full enclosure limits you from hearing and seeing things around you. Once in a while we would hear a bird call similar to a loon. That would completely freak us out, and startle us! The waves completely subsided, and we were gently rocked like a baby for our entire watch. I was tense the whole time, waiting for the waves to pick up, but thankfully they never did. When Chris poked his head up at 6AM, I told him we were fine and he could sleep some more. The light came quickly after that, and a new day began. As the first light started to appear, all we could see was the outline of a few clouds behind us. But even that small amount of candy for our eyes was a treasure. There was something to focus on, something to tell us where the sky ended and the sea began. When everything is grey, and you have absolutely no point of reference, your eyes play tricks on you. It takes a great amount of concentration to make sure the vertigo doesn't set in and the world around you doesn't start spinning. The light also indicates day, and makes it much easier to stay awake. A bit later when everyone was awake, Casey, Kaitlin and I went to the bow to watch for ships in the fog. The one nice thing about the fog is that container ships and large vessels are not allowed into the harbor when the fog is thick. This means that we don't have to worry about dodging them. We do have to worry about small vessels and buoys. We didn't see any small vessels, and managed to miss the buys. We pulled into the MEGA dock (that's really what its called!) in Charleston. We learned a lot from the past two passages. First is that we don't really like passages. Its tough to be at the mercy of the sea. You have no control. If things turn bad, you have no choice but to deal with it and move on. We've also learned that if things have the opportunity to turn bad, they will. Now instead of watching the coastal forecast, I like to check out the open ocean forecast as well. There is one forecast for the coast to 20 miles out, and another for beyond 20 miles. We tend to sail at the fringe of the 20 mile mark, so chances are our wind and waves will be a combination of both forecasts. Planning is key! And even then things inevitably change. This morning we got settled into our slip. Chris checked in, and as an added bonus got cable TV hookup for the kids. They were quite excited. Casey immediately proceeded to set the laptop up to receive television. As usual, I watched for about 5 minutes and then fell asleep. It's something about television that immediately zooms me to dreamland! Well, either that or the 6 hours of restless sleep the night before. When we were all mostly rested, we took the free shuttle the marina provides to visit town. We meandered through an open market, and then hit Hyman's seafood for dinner. We had what I think is now our fourth sampling of southern hushpuppies. Hyman's hushpuppies were a bit doughier, and less sweet than PJ's hushpuppies. So far PJ's in Southport NC have been my favorite. On our way to dinner, we stopped in what looked like a visitors center. They had and attractive display of brochures for the passerby to peruse. We walked in and were greeted by a gentleman asking where we were from, and how long we would be staying. He helped us find things to do in the next couple of days that were withing walking or shuttle distance. Then came the sales pitch. It was actually a promotion office for a local hotel. He asked if we wanted to take a tour of the hotel in exchange for 6 free tickets to any local attractions, or 3 $25 gift certificates to our choice of local restaurants. The tour is tomorrow at 9AM, and lasts about 90 minutes. We've heard about this happening before, and we knew it was a legit way to get free stuff, so we signed up. We decided to take 3 adult tickets to the aquarium, and 3 adult tickets to Fort Sumter. That totals to a $90 value! We were planning on going to these places anyway, so why not go for free! Cruisers viewing a time share...that should be a blast! 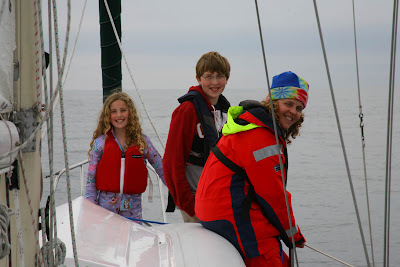 When we got back to the boat, we called the Wingloskis (sorry if I spelled that wrong!). They are neighbors of ours from East Greenbush who moved here a while ago. We're going to get together tomorrow in some shape or fashion. I'm excited to see them and share our stories. We're planning on being here for a week or so. We'll keep you updated with all of our Charleston, SC journeys! 1. Fish travel in flocks, not herds. Or, is it birds? Smart fish, like Poppies, I mean porppies, or porpuseses, travels in schools...thats how they get smart. 2. What where you doing looking into the head? That can be very dangerous!! Wait until you get to the equator. Theres a big upwelling of nutrient rich plankton there, the type that glows in the dark. It is really bright. I can tell you stories about the head, bright lights, actual flashes of light, in that area that happened to me...but some other day. 3. Who made the fog-horn noises? Or, was that a fog horn? Don't blame it on me! Don't know if you know about this weather program....but it gives you good info about winds...onshore and off shore. Got to www.grib.us for more info. Seriously, great you guys are doing well and my whole family said to let you know they wish you all the best!